End an event before its end-date. Extend an event beyond its planned end-date. Change the presenter to be another Training Assistant. Note: You can also see the event's URL and Token and can copy them to send to others. As the event's host, you are the default presenter in the classroom. The presenter can broadcast video/audio and controls what the rest of the attendees see. 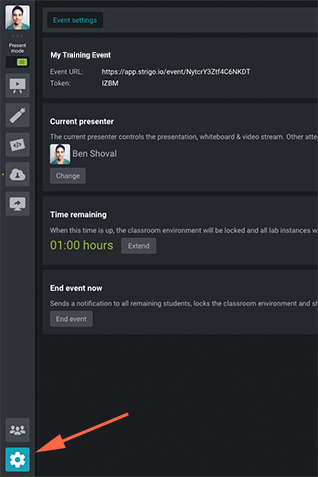 You can assign another training assistant to present during a live event. Once a training assistant has accepted an invitation to be a presenter, all students will automatically follow them, just as they've been following you until now. While someone else is the presenter, you will not be able to modify the whiteboard, add code-snippets or affect what users see in any way, to prevent collisions. Once the training assistant is done presenting, you can make yourself the presenter again by clicking the "Retake Presentation" button. Note: No warning will be shown when retaking presentation privileges. You can extend your event to give yourself and your students more time to finish what you started (via the Extend button). For instance, let's say your students say that they want to keep their labs on for more time than was previously configured so that they can finish practicing and copy some material they worked on. You can extend the event by 1, 2, 6, 12 and 24 hours and can do so indefinitely. Warning: Extending an event directly affects billing! You will be charged for any additional hours you provide your students via your usual rates. If you finished teaching before your designated end-date, you can simply end the event (just click the End Event button and approve). Note: You will not be charged by the designated date but rather by the time the event ended. Changing the host for an event which hasn't yet started is straight-forward and requires no confirmations. Anyone in the organization can do that by editing the event in the management panel. This allows to take control over an event in case an event's host is experiencing difficulties logging in or otherwise. 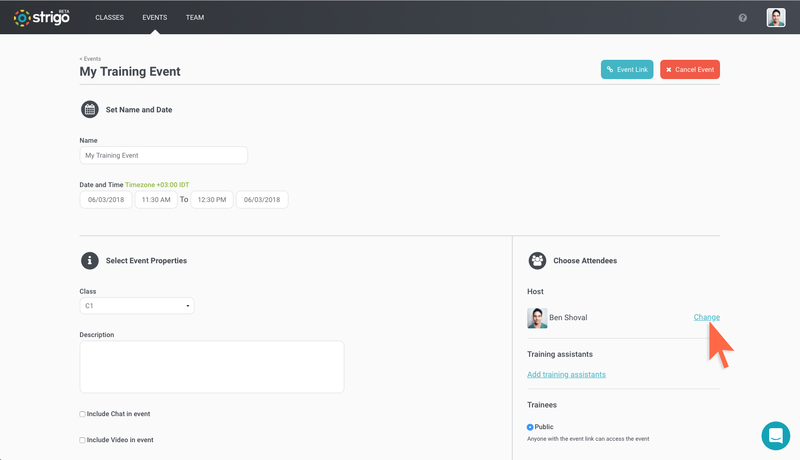 Note: If you wish to select someone who is currently configured as a training assistant to be the host, you must first remove them from the training assistants list.